Torquay is a delightful holiday resort on the south coast of Devon and it was there that I first saw the light of the day on 26th April 1920. My father was a doctor and my mother had been a nurse prior to her marriage. Class distinction existed more than it does today. My parents belonged to the upper middle class. My paternal grandfather had also been a doctor while my mother’s father was an admiral. The only grandparent I knew was my maternal grandmother and she died while I was still a young boy. I had two elder brothers but no sisters. The eldest, who was three years older than me, met an untimely death during the Second World War when the battleship on which he served was sunk in the Mediterranean by enemy action. My other brother, who was inclined towards religion from a young age (and is now a Roman Catholic Priest), was at middle age, a Protestant priest in the Church of England, but subsequently had to quit his vocation. He took up teaching as a profession in a school. He again had the urge to priesthood in the Roman Catholic Church. My mother also became a Roman Catholic soon after my brother’s conversion. She was a very religious lady all her life and regularly attended church. My father, however, was little interested in religion. One of my maternal aunts had been a missionary in china for forty years and had much to do in helping my brother first become a priest in the Church of England. When I was three years old my father bought a house situated on a hill overlooking Torbay. It was on the fringe of the countryside at a point called Barton Cross. I used to love to roam the fields and woods also to find my way to the many beaches, which were not so very far away. I enjoyed gathering wild fruits and nuts. When in season, I used to get up in the early hours of the morning and search the fields for mushrooms before other people appeared on the scene for the same purpose. Those days remain with me as living memories. My brothers and I went to Winchester Lodge Preparatory School. The headmaster was a keen cricketer who played for Wiltshire. I was in both the cricket and football teams. One by one we left the school, as we grew older and moved on to Monkton Combe, which is the name of a well-known public school on the outskirts of Bath. I never enjoyed school nor was a bright pupil. I left school at the age of sixteen without any kind of educational certificate. Once I expressed my desire to become a doctor and I thought my father would be pleased that I wanted to follow in his footsteps. He promptly rebuffed me and told me I could never become a doctor because I lacked the aptitude for diligent study. I left school at the end of the summer term in 1936. During that last term my mother had been granted legal separation from my father and had taken up temporary residence in Bath. Later she settled in Bristol. I was at a loose end and for nothing better to do I joined the army although I was far below eighteen, which was the required minimum age. My regiment was the Somerset Light Infantry and my pay was two shillings (ten pence) a day. Life was tough and I did not find congenial companionship as I had been brought up in a more cultured society. I had signed up for seven years, but at the end of my second year, I wrote to my father requesting him to purchase my discharge, which was the only way of terminating my service. He promptly sent me a cheque for thirty-five pounds and within a few days I was back with my mother. It appears that I still had some attachment for army life as I soon joined a Territorial Unit of the Royal Army Medical Corps. Territorials were part-time soldiers who normally did not have to train for more than one evening a week. War clouds were looming on the horizon and on 3rd September 1939, Britain declared war on Germany. My unit was immediately mobilized and once again I was a full-time soldier. We were sent to France and later moved up into Belgium. The German offensive pushed us back to the beaches of Dunkirk from where the battered remnants of the British Expeditionary Force were evacuated back across the English Channel to their homeland. I remember boarding a boat crowded to capacity with dishevelled and weary troops. Almost immediately I fell asleep and when I awoke the boat was entering Dover harbour. Relief organisations were waiting to distribute tea and refreshments after which we were dispatched by train to a destination in Wales where, as heroes and not as prisoners, we were billeted in the cells of a local prison. In 1941, I applied for a commission in the Indian army. I had to present myself before several interviewing boards and finally I was accepted as an officer cadet and sailed for India in 1942 with a contingent of other cadets. The ship was one in a large convoy, which took two months to reach Bombay. Our final destination was Bangalore where we underwent a six months’ course of training before being posted to our regiments as second lieutenants. I joined the 17th Dogra Regiment, which was stationed as Jullundur. Later was transferred to the Indian Army Ordnance Corps. I spent considerable time on active service in Assam and Burma. Perhaps one of my most memorable experiences was the siege of Kohima in the Manipur hills close to the Assam-Burma border. I was one of a motley force congregated on a wooden hill and completely surrounded by the invading Japanese. We were subjected to bombardment and attack for two weeks until reinforcements eventually broke through and relieved us. Supplies were dropped to us by parachute. On one occasion, in particular, I was very fortunate not to lose my life. We were in the trenches. A senior officer called me away from my position for a few minutes. During that brief period a shell landed in the trench on the spot, which I had just vacated. Two soldiers who had been near to me were killed. The fore mentioned event took place in 1944, in which year deeper spiritual inclinations seemed to awaken within me. I was never much influenced by Christianity. I had become quite enchanted with Hindu literature and a close friend of mine was a Brahmin. As yet I had not been attracted in any way towards Islam although I did enjoy reading about the lives of the Moghul emperors in Glimpses of World History by Pandit Nehru. Right up to that time my enjoyment in life was more or less the same as most young men. At sixteen I had become a regular drinker and smoker. Gambling was in my blood. When I was eighteen I had a temporary craze for dancing and, of course, I enjoyed going to the cinema and theatre. Although smoking is not specifically forbidden in Islam and may be considered a lesser vice, it was the hardest of them all for me to overcome. Nevertheless the physical and spiritual benefits gained from discarding that obnoxious habit have been immense. My unit was camped near Imphal, which was a frontier outpost close to the Burma border. An Ahmadi sergeant who was also serving in my unit concluded, for reasons best known to himself, that I might be a person to whom he could introduce the message of Islam. His name was Abdul Rahman Dehlvi. There were also a number of other Britishers attached to the same unit, but as far as I know, he never approached any of them. Naturally he had to exercise diplomacy in view of the fact that I was commissioned officer with whom it would not be normal to discuss or propagate freely his religion. He arranged for a copy of the ‘Philosophy of the Teachings of Islam‘ by Hazrat Mirza Ghulam Ahmad to be sent to me from Qadian. My senses were exceedingly dull in those days and for this reason I found much of its contents hard to comprehend. Nevertheless parts of it inspired me and uplifted my spirits. Later on I deliberately left it on the reading table in the officers’ mess but I do not think anybody paid much attention to it. That was more than thirty-five years ago, during which time I have read it thirty to forty times and, like the hopeful batsman, I may score fifty sooner or later. Two weeks leave were due to me and I was undecided where to go. Sergeant Abdul Rahman Dehlvi urged me to go and stay with one of his friends in Qadian, which was quite an unknown place to me and involved a long journey of approximately a thousand miles. A couple of days later I told him that I decided not to go. My pronouncement brought such a look of disappointment on his face that, merely out of sympathy for him, I immediately reversed my decision and promised to go for a few days. Imphal lay about eighty miles from the nearest railway link at a jungle base called Manipur. The two places were connected by a long winding road that snaked up and down and round about a succession of jungle-clad hills. This was the first stage of my journey. It took me at least a week to reach Qadian, which I then came to know, was a small isolated town. Nobody was on the station to receive me as no one had been intimated the time of my arrival. I hired a horse vehicle and asked the driver to take me to the house of Mufti Mohammed Sadiq, which was the name of the person, with whom I was supposed to stay. I was jogged along a bumpy road and then through some narrow streets until the driver stopped by a door in a wall inside of which, some steps led to another door on the level of a roof courtyard. I knocked on the upper door. A chain jangled inside and the door was opened by a white bearded elderly gentleman stripped bare to the waist, no doubt on account of the hot weather. He was Mufti Sadiq. Both of us were surprised to see one another. I introduced myself and forthwith Mufti Sadiq instructed the horse vehicle to take me to the guesthouse, where I was accommodated in a sparsely furnished whitewashed room. Shortly afterward Mufti Sadiq came around to meet me. This time he was dressed in flowing robes and wore a magnificent headdress. Later I came to know that he was a companion of the Promised Messiah, Hazrat Mirza Ghulam Ahmed, and also had been the first missionary to the United States of America. Next day Mufti Sadiq escorted me around Qadian drawing my attention to various places of interest. I remember asking him on that occasion, what was the attitude of the Jama’at towards smoking? He replied, while it was not specifically forbidden, it was discouraged. The highlight of my two-day visit was an audience with Hazrat Mirza Bashiruddin Mahmood Ahmad, the Khalifa and the supreme head of the Jama’at Ahmadiyya. This was a memorable event, although at that time I did not fully appreciate the significance of his spiritual status. He was seated on a chair on the verandah of his house. I do not remember the details of our conversation, though I do remember expressing my view that it was sufficient to follow the Ten Commandments in order to live a good life. His answer was to the effect that they were only some general principles which needed further clarification, such as the commandment ‘Thou shalt not kill’. I was impressed most of all by his luminous countenance, which radiated an intangible spiritual light, which seemed to shine from his face and when he spoke, a charming smile animated his face. He was an embodiment of energetic repose, radiating physical, intellectual and spiritual magnetism, which captivated all within his presence. I realized that I was in the company of no ordinary person. Generally I was impressed by everyone I met. This was what attracted me towards Islam more than anything else. My knowledge of Islam at that time was negligible, but I reasoned, that if these people were fruits of the faith, then it certainly had something to offer. I was in search of the truth and later I was to realize that I had found it in Qadian. A notable event took place in my life in the evening after my departure. I was waiting on the station at Amritsar which is a town about thirty miles from Qadian. While waiting for my connection, I joined some other officers for drinks in the refreshment room. I was suddenly overcome with a feeling of aversion. The atmosphere seemed repulsive compared with the holy atmosphere of Qadian. There and then I resolved to forsake drinking once and for all. One of the first things I did when I rejoined my unit on the Burma front was to throw away all the bottles of alcohol I had in my possession. The army was now on the offensive pushing deeper and deeper into Burma. The Japanese were in retreat and we reached a small town called Meiktilla. It was there that I made my decision to join Ahmadiyyat, the true Islam. I signed the Bai’at form and posted it to Qadian. That was, no doubt, the greatest step I had ever taken in my life. I have already mentioned that I was shackled to both these vices (drinking and gambling). Even on my historical visit to Qadian I carried a bottle of whisky and a bottle of rum in my luggage. Fortunately some higher power or my better judgment prevented me from taking drinks while I was there, although at that time, I did not consider drinking to be wrong in any way. I used to gamble on horses, greyhounds, dice and card games. Once when stationed at Imphal I lost a month’s pay gambling on cards with officers. These were the first two evils from which Islam rescued me. Prior to my acceptance of Ahmadiyyat, I used to contribute nothing in the way of God or towards charity. Islam taught me the philosophy of giving in the way of Allah. Sacrificing what one loves for the sake of Allah wins the pleasure of Allah and earns one abundant reward. I commenced by paying one sixteenth of my income and later increased it to one tenth (Al-Wassiyat). Finally in 1967, I commenced paying one third and have been doing so ever since. Despite the fact that I enjoy only a meagre income, life is good to me in every respect. In addition to Zaka’at, I also regularly give Tahrik-i-Jadid and Ansar contributions, plus payments towards my Jubilee Fund promise and various other appeals. I am still novice in the art of prayer. Prayer is more than a routine habit. I have gained much on the subject from the writings and discourses of the Promised Messiah may peace be upon him. They have been a source of inspiration to me. Sometimes it is a matter of wonder to me how any Muslim, who is attached to Islam with a sincere heart, can intentionally fail to offer the prescribed prayers as commanded by Allah. Once when I was in Qadian shortly after my acceptance of Islam, an announcement by Hazrat Khalifatul Masih II appeared on a board outside Masjid-i-Mubarak, stating that if anyone during a period of ten years, knowingly and deliberately forsook even one prayer of the day, then he could not count himself as a true Ahmadi. I had no goals or ambition in life before I accepted Ahmadiyyat. I had no plans for the future. During the war I was a soldier due to compulsory service. I was more or less drifting through life like a capsized boat in the open sea. Yet when I was a very young child I was once gripped by a powerful yearning, which occurred one night when I was bed. I wanted to become and do something extraordinary. I did not want to pass through life being just one of the crowd. I wanted to be unique in one way or another. At that time I am sure I was not more than ten years of age at the most. I do not recall ever thinking or dwelling on the matter again. It was just like a flash of the moment, which never re-occurred but must have taken root in my subconscious mind from where later it was to emerge into reality. It would appear that this was brought about through my acceptance of Ahmadiyyat as the following events may suggest. After his release from the army, when he arrived in England, he stayed for two days only at Bristol with his relatives and so, on the third day, he was at the mosque in London. During his conversation with me he expressed his willingness to live at the mosque and become a Muslim missionary. I explained to him the responsibilities of a missionary and the required qualifications for missionary work. Eventually I promised him to see to his case sympathetically for missionary work and would write to him this matter. He was a little bit upset from my reluctance in accepting his offer readily. After a few days he, however, dedicated his life for the service of Islam unconditionally like other waqifeen. I sent his application to Hazrat Amir-ul-Momineen, with my opinion that he might be a useful missionary. I asked him to come and stay with us and to begin the study of Islam. 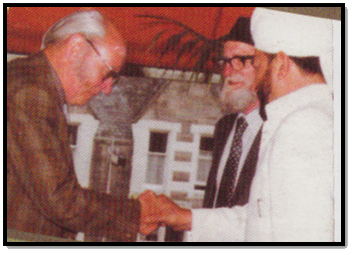 Hazrat Amir-ul-Momineen graciously accepted his Waqf and Mr. Orchard began to work with other missionaries. At this time you are unknown, no doubt, and unheard of, but soon the time is coming when nations will feel proud of you and sing your praises. So mind, you do not take lightly what you say and what you do. Do not think that your movements are only personal, no, but they pertain to the whole British nation. The posterity will imitate your movements and follow them to the letter…if your movements and activities will be in accordance with Islam, and noble and grand, then they will be instrumental in raising the moral tone of your nation, but if they are below the mark and not in strict accordance with Islam, your nation will be the loser, thereby try therefore, to set a noble example for posterity, otherwise God will have another man to fulfill this task. When Ahmadiyyat will have spread all over the world, and spread it must, no power on earth can impede its destined progress, then there will be reverence for you in the hearts of the people, greater, than the one which they have for the greatest of the Prime Ministers. I close this short review of my life with gratitude to Allah for his blessings and favours and with the declarations that all praise is due to Allah the Lord of all the worlds. Mr Bashir Orchard served as a missionary in England between 1946 and 1952. He was then posted to Trinidad, West Indies from 1953. In 1957, he was recalled to Rabwah for an eight month refresher course, after which he was posted as a missionary to Guyana, South America. In 1966, he was transferred to Glasgow and remained there until 1983, when he was posted to Oxford, England. In 1987, he was transferred to Islamabad, England, to concentrate on being Editor of a magazine called ‘Review of Religions’. Mr Orchard has written several articles and books on Islam including ‘Life Supreme‘ and ‘Guideposts‘. He would always take part in the Charity Walks and was determined to finish the walk, no matter what the distance was. He passed away in 2002. May Allah grant him the highest abode in heaven, Amen.